A black and white negative of Dr. Kenneth Craig Hobbs (1928-2010). Dr. Kenneth Craig Hobbs was born at Ottawa, Ontario, on 26 May 1928 and graduated from medical school in 1954. After a residency at Ohio General Hospital in Wheeling, West Virginia, he came to Whitby in 1957 with Dr. George Jaciw as a partner set up a medical practice from which he retired in 1991. Dr. Hobbs was very involved in community affairs in Whitby. He served on the Public School Board from 1962-65 (Chairman, 1963-65). He was a member of the Town Council 1968-73 and was Chairman of the Building Committee, Chief of Staff and a member of the Board of Governors from 1973-74. in 1976 Dr. Hobbs joined the Rotary Club of Whitby, serving as President in 1983-84 and the first District Governor for the club in 1985-86. From 1979 to 2007 (25 years) he traveled to India to do medical and humanitarian work for Rotary. In 1979 he established the first measles immunization program in India and in 1986 he began an immunization program for Polio, leading to the establishment of Polio Plus, Rotary's International program to rid the world of Polio by 2005. He wrote a book called "Diary of a Miracle" about his measles immunization program. He also did considerable work in Africa for Rotary International. In 1990 he received the Peter Perry Award as Whitby's Outstanding Citizen, the Order of Ontario (1998), Order of Canada (2002) and the Queen Elizabeth Golden Jubilee Medal in 2002. Dr. Hobbs died at Pickering on 6 May 2010 and is buried at Groveside Cemetery, Brooklin. 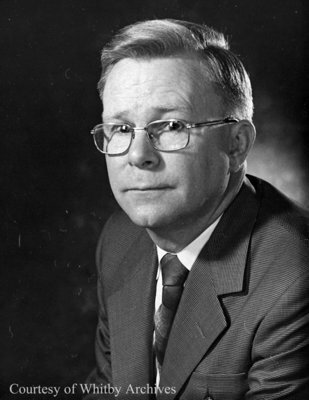 Dr. Kenneth Craig Hobbs, c.1974, Photographer Unknown. Whitby Archives A2016_017_024A.